As I have mentioned before and you may have seen in stores - Halos are in season November through May! These are definitely a family favorite and such a sweet, healthy snack!!! Sweet, seedless and easy to peel, Halos are easy to pack in lunches, great to share at kid’s activities and sporting events, and make a healthy snack choice any time of the day. Additionally, Wonderful Halos mandarins are a healthy alternative, delivering vitamin C in about 50 calories. With the New Year upon us, Halos truly are the perfect snack solution. As you make New Year's resolutions to eat healthier, lose weight and snack smart, Wonderful Halos mandarins are the perfect solution and helper towards that resolution! I know I am getting and eating these cute and tasty mandarins while I can! 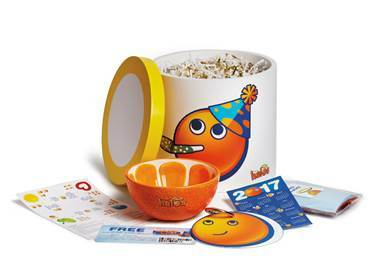 Wonderful Halos is generously offering (1) Wonderful Halos New Year’s Gift Box (includes fun family activity, craft and recipe idea cards; a Halos branded flash drive with the ideas; a Halos branded halo and wings t-shirt; a Halos branded container; and free Halos coupons) to a lucky winner! I meant to put Frontier Bites in the enter another giveaway entry - so sorry! Thank you! !